It takes a special kind of bike for Sky to win so many tour stages with, and following up from its little brother, the Dogma F8, the Pinarello DogmaF10 Road Bike 2017 is set to be the best road bike you’ll ever lay your eyes upon. From its low weight of just 820g, through to its fork flap dropouts that improve aerodynamics by 10% over previous models, everything about the F10 is optimised to keep you riding faster and further than ever before. The frame uses Pinarello’s renowned Toray T1100 1K Dream Carbon Fibre, used in the aeronautic industry thanks to its immense durability and strength, but it also commands a low weight to keep the entire bike lighter and more efficient. 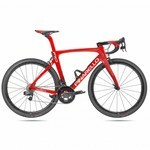 Whilst Team Sky and Jaguar had their inaugural partnership, Pinarello took advantage of their CFD (Computational Fluid Dynamics) technology, shaping and optimising every tube shape to cut through air with minimal drag. Flatback tubing and a 3:1 tube profile also ensures heightened stiffness. 7% stiffer than the F8, the F10 is truly a bike to behold. At 6.3% lighter than the F8, the F10’s frame is ultimately more efficient than the F8, but it’s not just the weight that sets it apart. The concave design of the downtube actually houses the Di2 batteries, but also shields the water bottle cages from the wind. Based around the Bolide time trial bike, this provides 12.8% less drag over other downtube designs. Even the Onda F10’s fork has taken features from the Bolide in the attempt to reduce drag. The fork flap dropouts ensure no air gets trapped around the dropouts, reducing wind resistance by up to 10%. All of these small, incremental changes add to to a huge advantage when you’re on the bike, but there are things which haven’t been adopted. The geometry of the F10 hasn’t changed from the F8, as the aggressive position is optimised for long, hard efforts in the saddle. Integrating Shimano’s new Dura-Ace Di2 9150 groupset ensures you’ll never miss a shift when riding. The split-second, reliable and powerful shifts of this drivetrain provides you with a wealth of opportunities when you’re climbing, descending or surging along the flats, too. The 11/28T cassette is optimised for every aspect of the ride, offering next-level climbing ability. Shimano’s Dura-Ace 9100 brakeset has also been included, allowing you to perform in both the wet and the dry. The Dura-Ace Di2 shifters/brake levers are powerful and reliable, but also allows for personalisation to ensure you’re as comfortable as needs be over long distances. The Fulcrum Racing Quattro Carbon clinchers with a 40mm rim depth perfectly compliment the Dogma F10 by staying lightweight, stiff and rigid throughout explosive accelerations and arduous climbs. The rim depth allows you to cut through the air, but also allows for gracious handling down technical descents. Perfect for the rider who doesn’t abide by one discipline, and loves to challenge themselves on a wide range of gradients.